Gorgeous herringbone tweed/generous collars combination! nice bit of herringbone that. childish face and a cool blue colour. 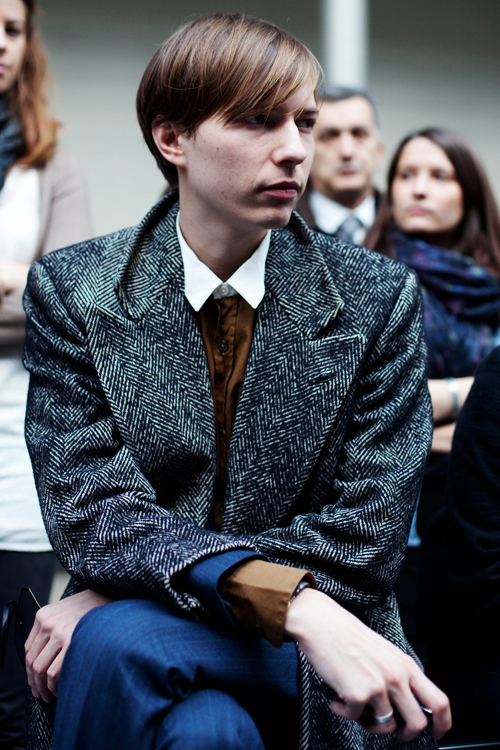 Love the tweed jacket and texture/color mix, especially at his wrist cuffs. Great foto & love your work Scott! thank you. From the thumbnail I thought this looked like a stylish version of Kenneth from 30 Rock! Must be the hair? love the contrast between trousers and shirt! does anybody know what label that shirt is?! Its all about the lapels! very elegant biy with classic coat! Did Louis Vuitton show in the street this year? This medium blue on brown layering is a great find. I wonder what colour his shoes were – hopefully a darker shade of brown? The patterned coat completes the outfit well but I wish we'd see this man without it! Very eccentric young man with FOUR colors in his clothing! Somehow or rather, the hair color seems to match the shirt. This blazer is so intricate! And beautiful. Wow…lovin' the blue/brown color combo. The jackets amazing too! LOVE a young man in nicely tailored clothing. nice hair too! Who is this guy again? I love the body language. This photo shows off the overcoat. However, this gent needs a tie that unites the elements of his clothing, especially with the contrast collar on the shirt. I think this photo shows how androgynous certain fabrics can be, and also how a subject chooses to wear a piece…the double cuff for example and also the sweetness of that collared shirt when there is no tie. Interesting. The visual definition of a dandy. I can't see enough to tell if it all hangs well but I do like the copper color in the shirt and the adjacent blue. Wow… great photo. It's almost like you've coordinated everyone behind the main guy to match both his hair and his outfit. The herring bone jacket really pops in this too. How is this "on the street"? In the same breath (movement?) you say it's at a Louis Vuitton show. Great execution of sleeve length. Also, there is a de-saturation about the photo that makes the image appear stark and blue. Very cool. This elegant pop-starry creature is a throwback to an '80s style that history seems to have forgotten _ the posh British tweed, the small neo-mod collars, the pale post-punk complexion and, of course, the very groovy undercut with floppy forelock. Blimey! Boys looked so good then. As this one does now. Hmmmm … Simply too feminine for my liking. And the coat seems oversized. OMG a big YES for his textured blazer. what a stylish man!! Ugh, I agree with Herrene here. Love to see more of his suit. I dig the tone/shade parallel between his shirt and his hair. Very nice outfit–he could be assured a great seat wherever he goes with his careful look. Love the entire outfit, but yes I too would like to see a tie. Once again, I acknowledge the youth for their sense of style. Wow, just think what he'll look like ten years from now. He has a look of someone already in the business. Great jacket! Hannes Hetta!! One again at the Sartorialist..
What is it with the fashion world? Great this and that, and lousy expression. Why do these who "have" look so miserable, or have an attitude? He looks like Kenneth from 30 Rock without the warmth and personality. LOVE the size of the patterning on the coat, it makes a difference. Wonderful shot, you really captured an attitude! ha, he looks like a young Jefferson Hack ! Stunning. And i'm digging his incredibly long hands and fingers. He looks absolutely not fussed about his surroundings, and i love that he's at a fashion show. priceless! He has this very spooky vibe. That blazer just fits everything together. This really looks like the Adam Kimmel's cashmere coat (hand-made in Italy, no less) that I got but had to return a while ago.